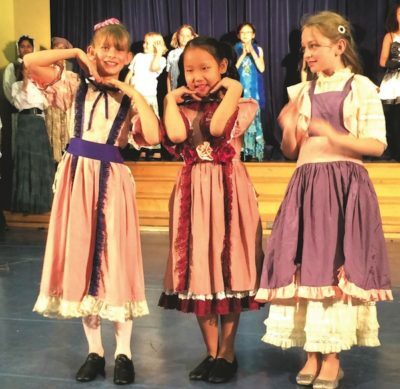 Whether your child is entering public, private, or parochial school, the arts are in full swing in most of our local schools, or at least are part of the curriculum. A sculpture workshop and violin lessons may not help get them a six-figure job down the road, but the arts can add beauty, meaning, and, well, art, to their lives. Lack of public funding has not slowed the beat in arts and music programs at Third Street Elementary School, 201 S. June St., where a little bit of help, actually a lot of help, comes from parents. Parents raise $275,000 annually from several avenues, mostly a Giving Fund launched the beginning of each school year, said Patricia Alexander, former president of the school’s booster club, Friends of Third. “BEAUTY AND THE BEAST” at Third Street — Gia Jordan (left), Angela Naranbaatar and Nadya Rozen. Some of the money pays for a Mac Lab (with 34 new computers), a kindergarten aide, physical education and more. But a chunk of it pays for three teachers: a kindergarten arts teacher and music and drama teachers. With 700 students, a three-member arts and music faculty doesn’t sound like much, but a little ingenuity can go a long way. “All of the students have access to all of the teachers,” explains Alexander. Theater arts are taught to third through fifth grades, and a production is held in the spring (the parents build the sets), said Alexander. A handful of fifth graders even take on Shakespeare. “SLEEPING BEAUTY” at St. James’. 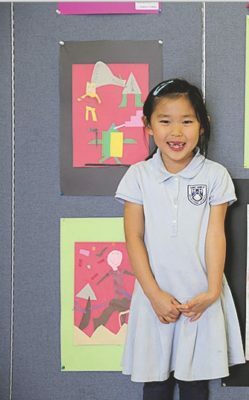 Creativity also is in full force at St. James’ Episcopal School, 625 S. St. Andrews Pl. The 370-student, preschool-through-sixth grade, campus offers theater, visual arts, music and dance. ARTIST Zoey H. at St. James’. “We have lots of art options,” said school spokesman Andrew Wright. 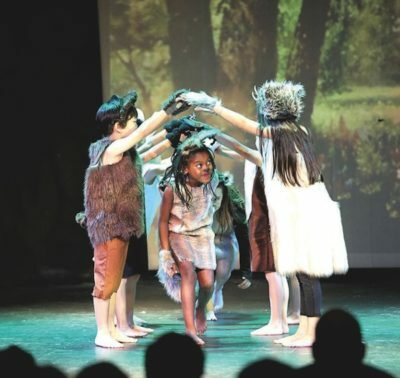 Students perform two musicals every year, as well as some Shakespeare, which last year was performed along with some adult actors. “It was pretty cool,” noted Wright. Art history concepts are tied into a weekly art class, which includes sculpture and painting. 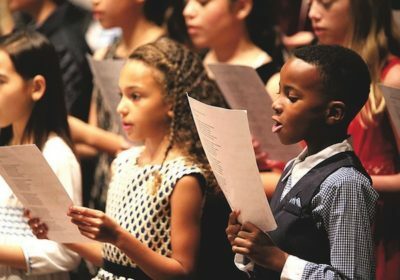 Choirs perform at Sunday services plus four concerts a year. Sixth graders can join a handbell choir, utilizing 12 sets of bells. Beginning and advanced band instigated under the auspices of the Colburn School is going strong. SAX player Gerald B. at St. James’. 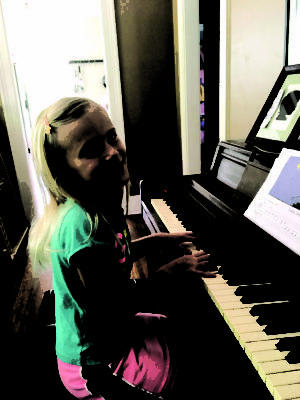 Private lessons make a big difference in augmenting group classes, says composer and pianist David Rhodes of Rhodes School of Music, 215 N. Larchmont Blvd. Students flock from even charters and private schools to Rhodes, where weekly half-hour private classes are taught to ages five and up. 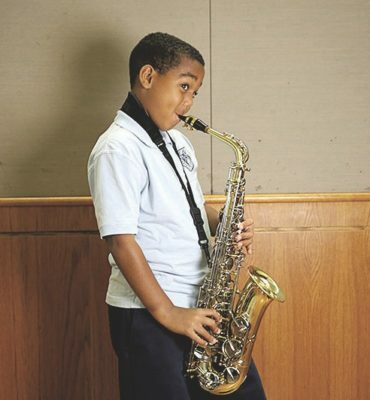 Learning an instrument boosts confidence and can improve a child’s quality of life. “Parents see the change,” says David. The parent-student connection is key, pardon the pun, from the child picking the instrument they want to play to what they choose to play. “They won’t practice something unless it’s something they like,” Rhodes said. Alice Oh can attest to that. Two of her boys, Jeffrey, 9, and David, 6, learn not only how to play piano, they create their own music. Instead of repetitiously practicing the same piece over and over, they “play their learned songs once every day. It became a part of their lives, and they are always humming tunes, in the car, while waiting, building legos. AT THE keyboard, Riley Grace Fitzgerald. The school “is a literal oasis in this town,” said Jennifer Fitzgerald, Beachwood Dr.
“The teachers are happy, nurturing, inspired artists themselves, and their passion feeds their instruction which in turn feeds the students. You see it in the smiles as they leave their lessons,” says Fitzgerald.